1 - Check the distance between water feeds and the ceiling. The distance must be at least 118 cm. 2 - Screw the s union connectors in to your fittings in the wall so that they extend by about 42 mm. 3 - Screw the escutcheons against the wall. 4 - Adjust the spacing so that there is 150 mm between the centres of the escutcheons, and then verify they are level . Adjust if necessary. 5 - Install the mixer and tighten firmly. The nuts must not touch the escutcheons. Adjust if necessary and verify horizontal positioning. 6 - Dismantle everything. Note the depth between the s union connectors and the wall. 6- Remove the red and blue caps from the mixer. Make sure the filters are placed correctly, with the rounded side facing inwards. 2 - Position the wall mount into the top fixing bracket shower rail, positioning the flat side towards the bottom. 3 - Check the bar's vertical alignment using a spirit level. 4 - Use a pencil to mark the hole locations, then remove the rail. 5 - Fit your drill with a 6 mm drill bit appropriate for the wall type. 6 - Drill 3 holes, fill them with silicon, then insert the provided rawl plugs. 7 - Place the flexible seal around the wall mount, then position the flat seal between the wall and mount. 8 - Screw in the wall mount. 9 - Put the escutcheon into place over the wall mount and put the shower rail back into position on the thermostatic mixer. Push the top fixing of the shower rail on to the wall mount and insert the 3mm grub screw and tighten. 1 - Insert the shower arm on to the shower rail and fix in to place using the 2.5mm blue locking screw. 2 - In this order: place the filter pointing downwards, then place the red seal in the head shower. Screw the head shower onto the shower arm. 3 - Make sure the head shower operates properly. 1 - Using a thermometer, check the water temperature. If it is 38°C when the handle guide lines up with the 38°C marker of the shower body, then no adjustment is needed. 2 - Screw the smaller end of the hose onto the thermostatic mixer. 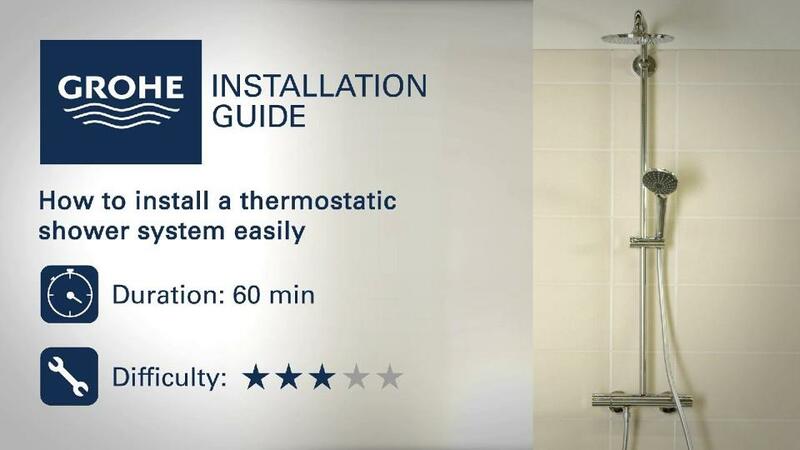 4 - Check to make sure the thermostatic mixer is operating properly with the head shower and head shower.